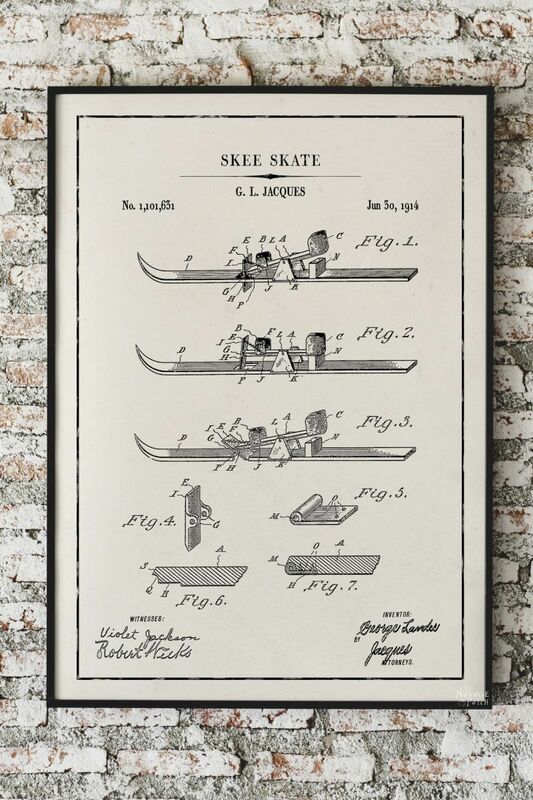 Decorate your walls this holiday season with our Winter Patent Prints! These free printables come in two sizes and your choice of background colors. It’s The Most Printable Time of the Year here at The Navage Patch! We can finally embrace winter and Christmas without raised eyebrows and clucking tongues! 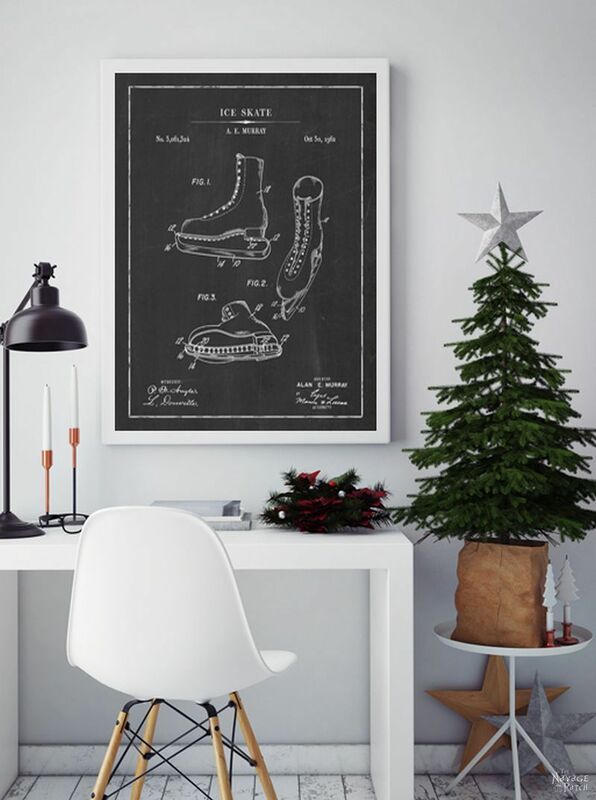 Do you remember the Christmas Patent Wall Art we shared last year? Click on the picture below to check them out if you haven’t seen them yet. Well, because you all really liked those printables, as usual, my dear wife has been burning the midnight oil to bring you guys another AWESOME selection of free Christmas printables. 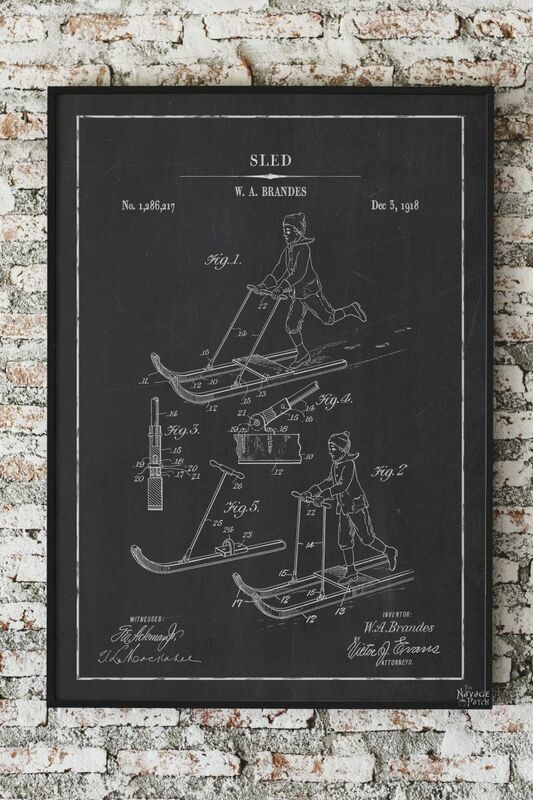 This time, we’re offering you these beautiful winter patent prints, and let me tell you something – our price (FREE!) is a heck of a lot better than the price you’ll find (totally not free!) for the same prints at the store-that-shall-remain-nameless! I’ll give you a hint. 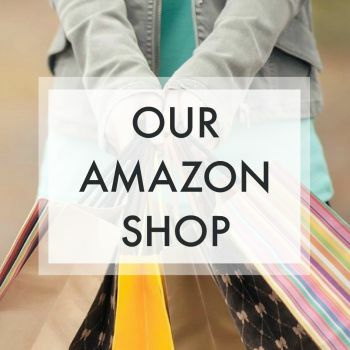 The store name begins with a “P” and a “B,” and it rhymes with Lottery Yarn. 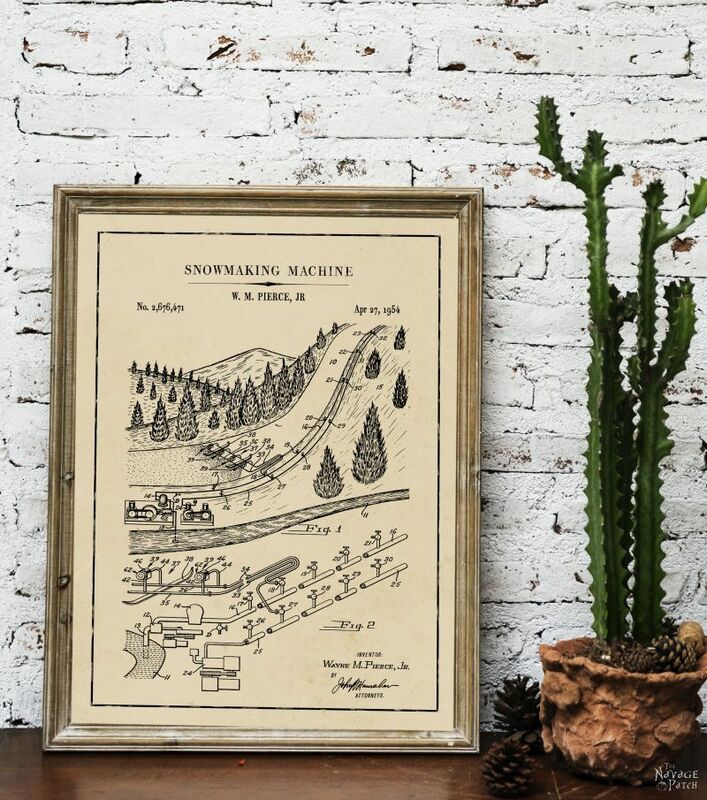 So, if you like tossing about $250 for just one winter patent print, then by all means, visit Lottery Yarn and knock yourself out. 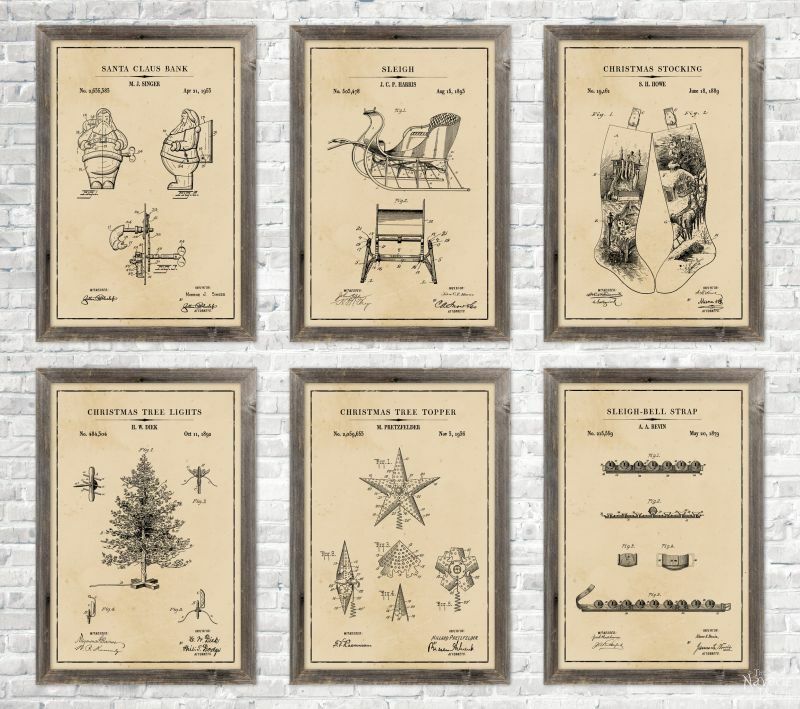 But if you are smart and frugal and beautiful inside & out, then download our free printable winter patent prints, send me a check for $125, and congratulate yourself on saving $125! Or, you know, just print them out and don’t send me anything. It’s fine. Really. I didn’t want $125 anyway. Enjoy your free printables, stay warm if you live near us or north of us1, be nice to everyone so Santa doesn’t give you coal, and don’t forget that Handan and I are always working for you! I don’t recall ever seeing a sled like the one below, but hey, 1918 was a little before my time. The only sled I remember with a handle of sorts was called a Banana Sled (at least, that’s what we called it. It belonged to one of the neighbor kids, so I don’t know the official name). Like it’s name, it was an oblong yellow sled resembling a banana that you stood upon. You held onto a rope that was tied into the nose of the thing, and you rode it kind of like a snowboard. Does anyone else remember that sled? I remember falling a lot when I would ride it! 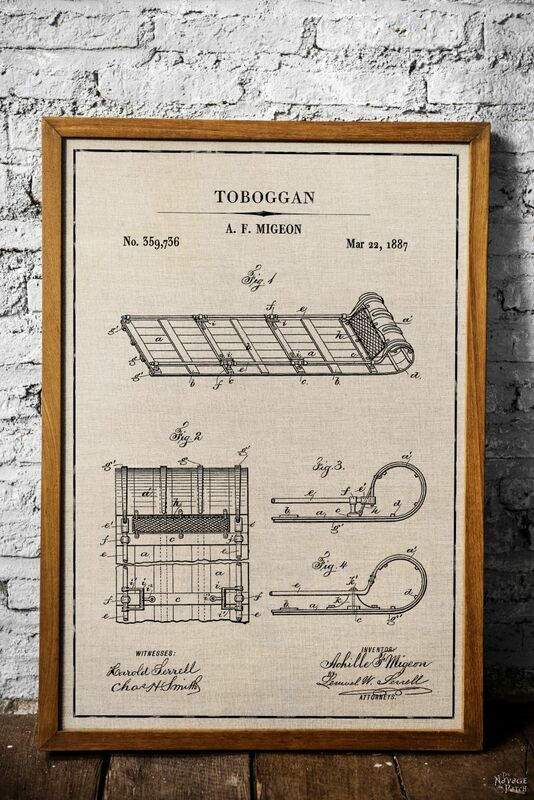 When I was small, one of the neighborhood kids had a toboggan. We were taking turns sliding down the hill in my yard. It was an icy day, which made it much more fun, since we could carry enough speed to blast through the flat section at the bottom of the hill and hit another hill in the woods at the far end of the yard. It was my turn, and I was sledding head-first, lying on my stomach. I built up a good head of speed and barreled through the flats and fairly flew into the forest! Fear and excitement honed my senses. Which is why it was weird that I didn’t notice the birch tree speeding towards my face until it was far too late. Is it a wonder that kids these days do everything with helmets? Every winter, we kids of Pennywise Lane and Fox Den Road used to gather our skates and hockey sticks and shovels and walk down the road to Wood Pond, where we would clear the ice and play a game that loosely resembled hockey. As with all sports in my youth, I was terrible, though I did enjoy sliding around on the bumpy ice. You can’t skate on Wood Pond anymore. The homeowners who line the pond don’t allow it. Is there any kiddish fun left in this country that insurance companies haven’t quashed? When I lived in Colorado after college, a company came out with a modern version of these called Sled Dogs. They were basically skis that were as long as a boot. We used to rent them out from the ski shop I worked in. 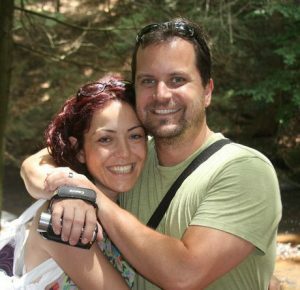 The intrepid souls who rented them looked hysterical careening down the mountain with their arms flailing like wild turkeys trying to fly. I started skiing when I was in 7th grade. That was late for these parts. But I took to it and lived and breathed skiing throughout high school and college. After graduation, I moved to Colorado to continue skiing before joining the Real World. Like any red-blooded skier, I held a healthy disdain for snowboarders and all things snowboarding. Until one calm morning on the chairlift when I spotted a lone snowboarder carving the most graceful turns I’d ever seen on a well-manicured run down the face of Winter Park. I picked up a snowboard the very next day. I grew up skiing in the East. If you can ski here, you can ski ANYWHERE. Typically snow conditions in the East are Crap, Hardpack Crap and Boilerplate Ice. When I lived in Colorado, and later, California (and snowboarded in the Sierra Nevada mountains), the snow was a revelation! And very little need for snowmaking. But those loud, hissing snow guns are an all-too-familiar sight and sound for those of us in or from the East! 1If you live south of us and someplace that stays warm all year long, I may need to ship Handan down to you for the winter. She doesn’t eat much or take up much space, and she’s very easy to care for! 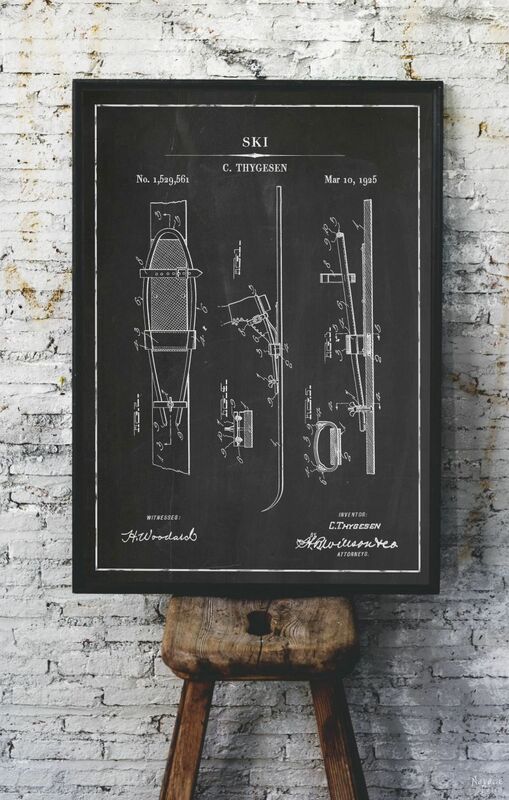 As usual, here is some information on the printables: we designed these free printable Winter Patent Prints in several colors and to fit into a 16×20 inch frame or a 24×36 poster frame, though you may scale them up or down as necessary. 24×36 inch scales down easily to 20×30 / 16×24 / 12×18 / 8×12 / 4×6 inches, and 16×20 inch scales down to 12×15 / 8×10 / 4×5 inches with no problems. If you need help with scaling down these printables so you can print them using your home printer, then make sure you check out our “How To Easily Resize Pictures” post. Now it’s time to click on the button below to download today’s free printable Winter Patent Prints – they are all in the Patent Art (and also Christmas) section of The VIP Patch. Beautiful. Just what my winter decor was missing. I’m glad you like them, Sara! This old farm girl from Utah is hooked, keep up the good work, you two. Thank you for this beautiful comment, Rulayne! Words like yours keep us going! Have a great weekend! I love your printable. Can you give me some pointers to find some firefighter ones? Hi Crystal, Handan found these Firefighter printables you may be interested in. 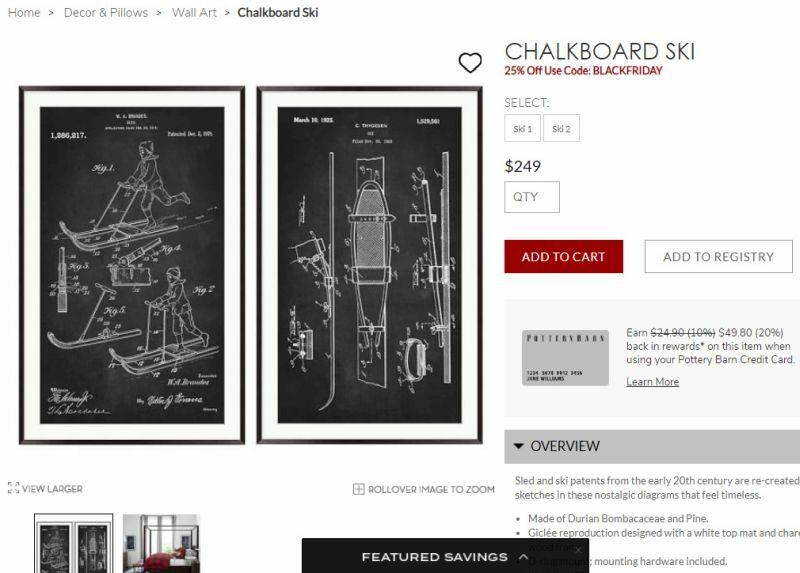 I found your site some time ago looking for patent prints for my kitchen. I just found the wine ones but suscribed anyway because I loved the site. You have great ideas and prints. Thanks! Not to be too dense, but do I print the black background images on black paper or do they print the black background when printing? I hope to not empty my ink cartridge out by priting a full set of 11×14 images and want that deep black background with white lines/wordage. Help please. Hi Stephanie, all our printables are meant to be printed on white paper. All the backgrounds are printed. I hope y’all get to do blogging full time soon and quit your other jobs because you two are awesome! Thanks for these…you’ve got my mind spinning for my tree design for NEXT year!! (Because I’m crazy like that and plan for it all year). But I am going to print out a few for this year too. I’ll find somewhere to put them! Thank you for all the free printables and great ideas! I’ve just recently found your site and I am amazed at the talent I am seeing here!! I just want to read and see everything. Thank you so much for the beautiful prints. I cannot wait to get mine up!! Happy Holidays! Thank you so much, Sandy, and welcome to The Navage Patch!